a central place where older adults and other community members can gather for activities. In response to the findings of the needs assessment, the Town of Bowdoinham Select Board appointed the Advisory Committee on Aging (COA) to address issues and concerns of older residents. Bowdoinham became the first community in Maine to be accepted as part of the WHO Global Network of Age Friendly Cities and Communities in 2014. COA advocates for increased accessibility to town buildings and town-sponsored events, bringing the concerns residents share with COA members to town employees and to the Select Board. Participants in a fall prevention class completed a safety and accessibility assessment of the Town Office. COA brought their recommendations to the Town manager who made many of the requested changes (e.g. adding brighter lighting and replacing existing door handles with lever handles). Several residents complained that an annual town event, Celebrate Bowdoinham, was not accessible. At COA’s request, Celebrate organizers added sitting areas, signage for handicapped parking, and a drop-off area closer to activities. COA members, collectively, provide more than 1,000 hours each year in direct service to older residents so that all activities and events sponsored by COA can be offered free of charge. COA members and community volunteers facilitate the Shipmates Senior Club, offer ongoing exercise opportunities (e.g. tai chi and line dancing) and special classes (e.g. kayaking, geo-caching, mushroom walks), provide social opportunities (e.g. bridge, cribbage, movie afternoons), and organize field trips. This year, COA organized a wellness fair that featured free flu shots, balance assessments, and blood pressure checks. A volunteer provided healthy snacks with nutrition information and recipes. Although Bowdoinham has accomplished a lot in the past two years, Bowdoinham’s plan to increase age friendliness is not complete. 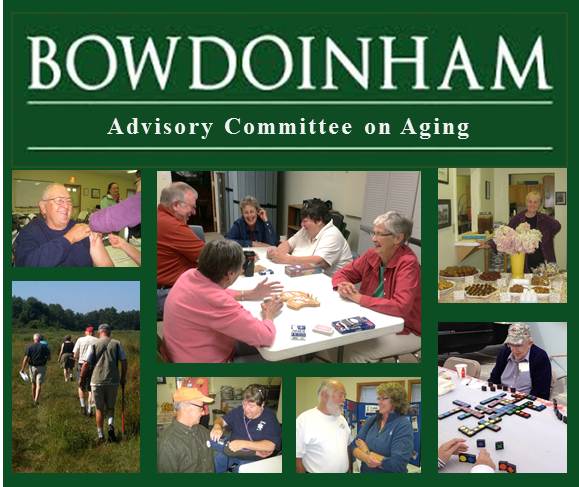 The next step will be to create a 3-year plan that will reflect the desires of older residents and guide the ongoing work of Bowdoinham’s Advisory Committee on Aging.